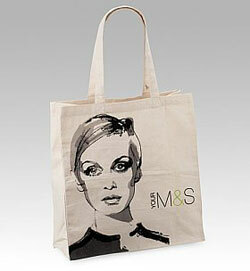 2007 has been the year of the eco shopping bag – and this Twiggy eco shopping bag from Marks and Spencer is up there with the best of them. UK readers will probably know that Twiggy has become the face of M&S – but thankfully the bag features her classic 60s mug rather than a modern likeness (not that she hasn’t aged well), drawn by fashion illustrator David Downton. Made from organic cotton, you can buy one instore or online for a bargain £2.50. Hello, please help me, where could I found the bag? I want to order. on the website is not anymore.